Alu-gard doors and windows incorporate a strong 1.6mm thick aluminium sheet that is perforated and powder coated to exacting standards. The sheet is retained in the door or window frame with a riveted aluminium wedge retention system. The resulting screen is strong, extremely resistant to corrosion and provides clarity of vision. The retention system fixings for doors are concealed with a special cover strip to provide a smooth and clean finished product, when viewed from both inside and out. The cover strip is also available for windows, where the application is suitable. 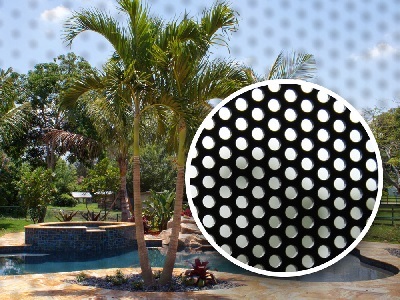 The perforated sheet is provided in a black colour to assist with visibility, and the door or window frame is available in the full range of standard colours, or can even be finished in a non-standard powder coat colour if required. All frame corners are mitred, and the addition of quality locks ensure Alu-gard doors will remain functional and last for many years to come. A significant feature of this product is the ease in which it can be cleaned. As the perforated sheet is flat it is a simple task to wipe over the surface with a duster or a cloth, making maintenance easy and straightforward. Being an all-aluminium product, it is also very durable and corrosion resistant in coastal regions or high-moisture locations such as river or lakefront areas.